A powerful controller is available in PC-based automation technology that unites all components of a wind turbine on a single platform. BECKHOFF Automation will present its PC- and EtherCAT-based automation solutions for wind turbines from September 18 to 22, 2012 at Husum WindEnergy in Germany. Beckhoff offers an integrated approach to wind turbine automation with PC- and EtherCAT-based control technology that provides for reduced hardware costs, simplified maintenance and exceptionally efficient control of wind turbines. Beckhoff’s automation solutions have helped automate 7,000 wind turbines with a total output of 11.2 GW in 2011 alone. Worldwide, more than 20,000 wind turbines including offshore installations are equipped with Beckhoff control technology. The highlight of this year’s trade show presentation is the Beckhoff solution for ultra-high-speed wind farm networking on the basis of EtherCAT. Beckhoff’s PC-based automation technology offers powerful controllers that unite all components of a wind turbine including operational management and control of pitch, generator, converter and brake, as well as condition monitoring and farm networking on a single platform. Beckhoff’s single platform automation approach eliminates special hardware, lowering the costs of the wind turbine’s basic electrical equipment as well as maintenance, while increasing the availability of the wind turbine. The open, scalable automation software, TwinCAT forms the core of the Beckhoff PC-based control platform with open interfaces permitting the integration of third-party software for SCADA, condition monitoring, obstruction lighting or foundation monitoring. The hardware interfaces for these functions are integrated into the controller via standard EtherCAT terminals. A large variety of interfaces enables the integration of lower-level fieldbuses such as CANopen, PROFIBUS and Ethernet TCP/IP as well as RS232/RS485. Relocating subsystems into the field considerably reduces infrastructure costs and simplifies communication. In comparison with conventional IP solutions, wind farm networking with EtherCAT is faster and offers considerable cost benefits. With the EtherCAT Power Measurement Terminal integrated in the automation system, momentary current and voltage values can be measured at up to 10,000 samples/s at the infeed point, allowing early diagnosis of voltage drops. It is also possible to generate a reaction of an entire wind farm to an LVRT case. Thus, if a voltage drop is diagnosed at the infeed point, it can be signalled to all turbines in the entire farm within 1 ms. The measured values of all wind turbines and the measurement at the infeed point of a farm can be synchronised to a timeframe smaller than 1 μs via the Distributed Clocks in EtherCAT. With this data, the current, voltage and frequency can be controlled accordingly and the grid can be supported optimally. The PC- and EtherCAT-based control platform integrates the CMS (Condition Monitoring System) function seamlessly into the existing automation system, helping to monitor all the turbine states, including gearbox, main bearing and generator. 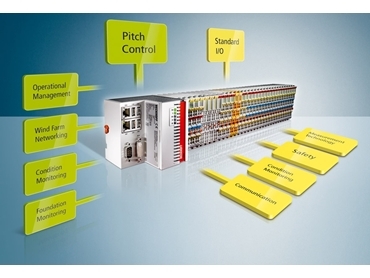 The CMS function is integrated into the I/O terminal system via a Beckhoff EtherCAT Terminal. The data is acquired by the terminal and the TwinCAT automation software platform makes the raw data available within the controller. The real-time component of the CMS software is integrated into the controller via TwinCAT. The CMS analysis software, which diagnoses the acquired data and initiates a corresponding downstream service, is coupled by the user via a standard interface such as OPC, enabling condition monitoring of the entire plant with time-synchronised data.